You are currently browsing the tag archive for the ‘Electoral College’ tag. American voting, 50 years down the road, still not democratic! 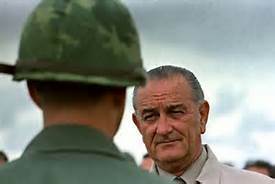 When Lyndon Johnson stepped before a joint session of Congress nearly 50 years ago, on March 15, 1965, to endorse the Voting Rights Act, he proclaimed,: “It is very deadly to deny your fellow Americans the right to vote in this country.” Of course, he was referring to blacks. Yet today, in 2014, the unwillingness of Congress to replace the dangerous and obsolete Electoral College system of electing our Presidents means that we are still far, far away from a one-person/one-vote democracy in America. Twice before, as recently as 2000, the candidate who got the lesser electoral votes was elected President. There is a path open to change that failure. Go to Nationalpopularvote.com to learn how. States representing about half the electoral votes have already enacted legislation to enable a national popular vote. Has yours? Let’s bring true democracy to America in our lifetimes. 200,000,000 Million Americans Won’t Matter in November? If you live in one of the approximately 40 fly-over states where Presidential candidates won’t campaign or spend money on advertising this fall, you will be one of the 200 million Americans who won’t decide who gets elected the next American President. How so? Because unless you live in one of the 7 to 14 states where the number of Republicans and Democrats is so close that the election could “swing” to either party, your vote won’t count when the obsolete and dangerous real election takes place in the Electoral College, a hold-over process from the Colonial days when the Congress didn’t trust the average citizen to know enough about the candidates for President to make an informed decision. There is a better way, a way to assure that one-person/one-vote will determine our next President. I delivered an essay explaining this issue on election-eve 2008, which you can read at: http://chilit.org/Papers%20by%20author/Ebeling%20%20-Collage.htm. For the latest information o the movement to change the electoral process and make it fair, go to http://www.nationalpopularvote.com. Make every vote for President this fall, including you own, count. Is a Social Market Economy the Answer? With the unchecked excesses of Wall Street and the financial markets in mind, and the growing, yawning gap between the “have’s” and burgeoning “have-nots” of American society in mind, maybe it’s time to move to some Americanized version of the German Social Market Economy model (http://en.wikipedia.org/wiki/Social_market_economy). Germany’s hybrid of a U.S.-type mixed economy, with its commitment to free enterprise, together with strong government regulations to protect social services and prevent private excesses, has been in place since after WWII, and pretty successful by most standards. It is NOT socialism, but a modern system that recognizes the pragmatic reality of the strength of a robust private economic sector, with the social protections that economic self-determinism alone cannot assure. Of course, and I say that because it is self-evident to me, our government needs major reform, if not a new Constitutional Convention, if it is to assume a responsible role in a sane and democratic future. Lop-sided influences need to be removed from the electoral process, starting with federal funding of federal elections, term limits in Congress to restore “citizen government.” Further we need to reform institutions that defeat the “one person/one vote” democratic principle. Kill the obsolete Electoral College system of electing Presidents, that allows election in 11 or 13 “swing states” to determine the Presidency. Consider eliminating the Senate, which is a weak shadow of the old British House of Lords, and represents real estate rather than people, with its two-senator-per-state system that gives the citizens of some states 60 times the voting power of the largest states. It is time to reform and evolve both our market economy and our representative government, and it must be done soon and together if either, if both, are to remain viable through the 21st century. Vermont Governor Peter Shumlin signed the National Popular Vote bill, making Vermont the eighth jurisdiction to enact the legislation. The bill has now been enacted by jurisdictions possessing 77 electoral votes—29% of the 270 electoral votes needed to activate the legislation, including the District of Columbia (3 electoral votes), Hawaii (4), Illinois (21), Maryland (10), Massachusetts (12), New Jersey (15), Vermont (3), and Washington state (11). The National Popular Vote bill has now passed 31 legislative chambers in 21 places, including chamber(s) in Arkansas, California, Colorado, Connecticut, Delaware, the District of Columbia, Hawaii, Illinois, Maine, Maryland, Massachusetts, Michigan, Nevada, New Jersey, New Mexico, New York, North Carolina, Oregon, Rhode Island, Vermont, and Washington. A map on our web site shows the progress of the bill in each state. At the present time, the National Popular Vote bill has been endorsed by 2,003 of the nation’s state legislators (27% of 7,424 state legislators). One of the most important things you can do to support the National Popular Vote bill is to write your state legislators and state officials asking them to support the bill. You can quickly and easily send an e-mail to your state legislators by going to http://www.NationalPopularVote.com/write. Our system will provide a suggested letter, which you can edit. Under the National Popular Vote bill, all the electoral votes from all the states that have enacted the bill would be awarded, as a bloc, to the presidential candidate who receives the most popular votes in all 50 states and the District of Columbia. The bill would take effect only when enacted by states possessing a majority of the electoral votes-that is, enough electoral votes to elect a President (270 of 538). The bill would thus guarantee the Presidency to the candidate who receives the most popular votes in all 50 states and the District of Columbia. The shortcomings of the current system are caused by the winner-take-all rule (i.e., awarding all of a state’s electoral votes to the candidate who receives the most popular votes in each separate state). Under the current system of electing the President, two thirds of the states are ignored by the presidential campaign; a second-place candidate can win the Presidency; turnout is depressed in the spectator states; and every vote is not equal. Because of the winner-take-all rule, presidential candidates have no reason to poll, visit, advertise, organize, or pay attention to voter concerns in states where they are comfortably ahead or hopelessly behind. Instead, candidates concentrate their attention on a small handful of closely divided “battleground” states. 98% of the post-convention campaign events involving a presidential or vice-presidential candidate occurred in just 15 closely divided “battleground” states. Two thirds of the states were ignored by the presidential campaigns in 2008. Back from 10 days traveling the beautifully rugged interior of Spain, party politics in the U.S. looks smaller and smaller, through the prism of a distant culture. It’s hard to say there is much to admire in either the Republican or Democratic parties these days, and even less in splinter groups. My feeling is that general apathy towards party politics is growing in the U.S., or at least it ought to be. Our obsolete Electoral College system of electing Presidents pretty much assures that a multiple party system, that might offer some hope for the disenfranchised electorate, has no chance of developing. Party politics needs to be reinvented in time to save our democracy, with vision, transparency and wisdom, rather than stale rhetoric, insider deals and narrow-minded moral parochialism, as its pillars. Meanwhile, I’m not going to the “party” — any of them. What “rights of smaller states” does the Electoral College protect? Here’s a lift from the Wikipedia entry for the undemocratic Electoral College system of indirectly electing our U.S. Presidents and VPs. I’d like to know what “rights of smaller states” the electoral College is supposedly protecting, other than giving them geographically outsized electoral weight, instead of counting voters, like you and I. Does geography deserve more influence on selecting our top leaders than the votes of people? For more information, also look in Wikipedia under National Popular Vote, and tell your legislators you’d like your vote for President to count equally with that of all other U.S. voters. By the way, the Electoral College system also disenfranchises citizens in U.S. territories from voting for President. If you look further, you’ll see the Electoral College was originally passed to allow slaves in southern states to count for 3/5th of a vote, and also then effectively disenfranchised women. The EC is a blight on our Republic!